A CGM provides continuous insight into glucose levels throughout the day and night. The device displays information about glucose speed and direction providing users additional information to help better manage their diabetes. It automatically checks your glucose levels every 5 minutes and can display your glucose numbers in real-time on a compatible smart device or receiver. Some CGM’s feature a convenient application that is accessible to iPhone and Android users. Sensor – A small sensor is inserted just beneath the skin and measures your interstitial fluid for glucose values. Typically, a sensor is approved to remain underneath the skin for up to 7-10 days. Transmitter – A small wearable that is affixed to the top of the sensor and sends glucose data wirelessly to your compatible smart device or receiver. Display device - A compatible smart device or receiver will have a display screen where you receive your current glucose number and the ability to review past and present glucose trends with your physician for better diabetes management. A1c Reduction: CGM has proven to be the best outpatient glycemic management system for reducing A1C. People with type 1 diabetes have experienced an average A1C reduction of 1.3%*1. Real-time glucose information: CGM provides real-time information about your glucose level speed and direction (high or low), so you have more insight for proactively managing your diabetes. The Dexcom G6 eliminates fingersticks for calibration, diabetes treatment decisions and diabetes management*. The Dexcom G6 CGM System can now be used in place of fingerstick testing for treatment decisions*. The Dexcom CGM System is approved for ages 2 years and older on the abdomen and lower back. For 18 and over, the Dexcom CGM is approved for the abdomen. The Dexcom CGM is compatible with iOS and Android platforms which allow glucose readings on a compatible smart device†. The Dexcom also has a Share feature which allows you to share your glucose readings with up to five individuals‡. 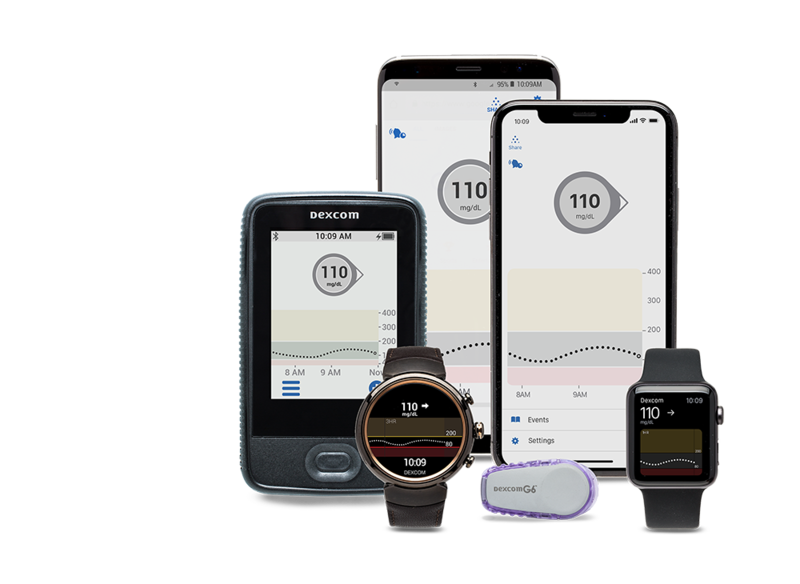 By downloading the Dexcom Follow® app, followers can view your real-time glucose data directly from their smart device giving you the circle of support you need. Visit www.Dexcom.com/Dexcom-with-share for more information. Medtronic Minimed 670G system is the first Closed Loop System; it is accompanied with a new Guardian sensor which will automatically stop and restart insulin based on your preset target blood glucose levels. The pump is able to adjust your basal insulin every 5 minutes to keep you in your target range 24 hours per day. ‡Do not make treatment decisions based on share and follow readings. Always confirm with your compatible smart device or Dexcom receiver. 2 Soupal J, Petruzelkova L, Flekac M, et al. Comparison of Different Treatment Modalities for Type 1 Diabetes, Including Sensor-Augmented Insulin Regimens, in 52 Weeks of Follow-Up: A COMISAIR Study. Diabetes Technol Ther. 2016;18(9):532-538.